Monika also used pens to trace the stencil, filling in some hearts with stripes. 1. Create a layout using a stencil. We would love to see a Scrapbook Circle kit – and the heart stencil – in action, but any materials will do. 3. You have TWO WEEKS to play. Enter by 9:00 pm Pacific time on Wednesday, February 4th, to be eligible to win this fabulous Basic Grey J’Adore prize package! I love your layout!! Here is my entry I used Bo Bunny glitter paste and a couple different kits from last summer. I think they are July and September. I love the artsy look and the muted colors of your layout. What a fun challenge! I actually cut the united states stencil on my layout out of Hazel & Rubys “Cut your own stencil” material, placed it on the tag, water colored around it then peeled it off! 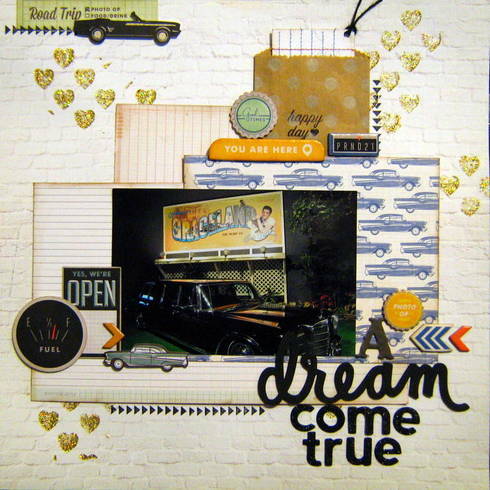 Love the inspiration pix, but I used my stencils a bit differently, for a journal page, hope that’s OK here. I loved using the stencil with my markers.